Hailed as the dawning of a new era for the German car maker, the new flagship saloon has been comprehensively re-engineered. Audi intends it to mount a successful challenge against upmarket rivals such as the BMW 7 Series, Lexus LS and Mercedes-Benz S-Class. The new A8, which is tipped to be priced from just under £70,000, draws on the latest evolution of Audi’s MLB platform. Inside, the new Audi has a clean and contemporary-looking dashboard, a redesigned multi-function steering wheel and touchscreen controls closely modelled on those first seen on the Prologue concept car. Highlights include new front seats that are 4kg lighter than those in the old A8, high-definition digital instrument graphics and a revised MMI (Multi-Media Interface) system with two separate displays — one measuring 10.1in and the other an 8.6in curved unit. At 5172mm long, 1945mm wide and 1473mm tall, the new A8 is 37mm longer, 4mm narrower and 13mm taller than its predecessor in standard guise. The A8L’s 130mm-longer wheelbase extends its length to 5302mm, with added ride height bringing 4mm to its height, at 1488mm. The body of the new A8 makes use of more materials than any previous Audi model. Aluminium makes up 58% of the structure, but it also adopts steel, magnesium and carbonfibre, which forms the basis of the rear bulkhead. 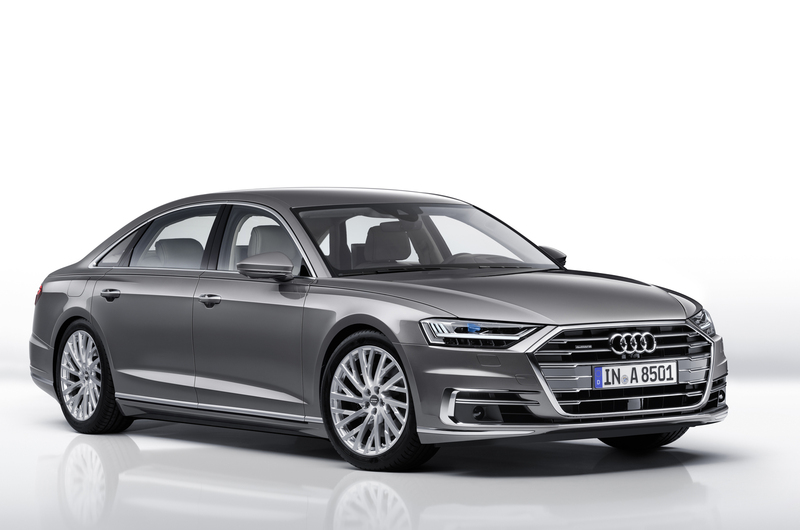 The new fourth-generation Audi A8 has been unveiled in the run-up to the start of UK sales in October. Hailed as the dawning of a new era for the German car maker, the new flagship saloon has been comprehensively re-engineered. Audi intends it to mount a successful challenge against upmarket rivals such as the BMW 7 Series, Lexus LS and Mercedes-Benz S-Class. The new A8, which is tipped to be priced from just under £70,000, draws on the latest evolution of Audi’s MLB platform. It offers the same 48V electrical system used in the SQ7. There will also be a new hybrid drivetrain that offers an electric-only range of up to 31 miles and there is advanced road-scanning active suspension. 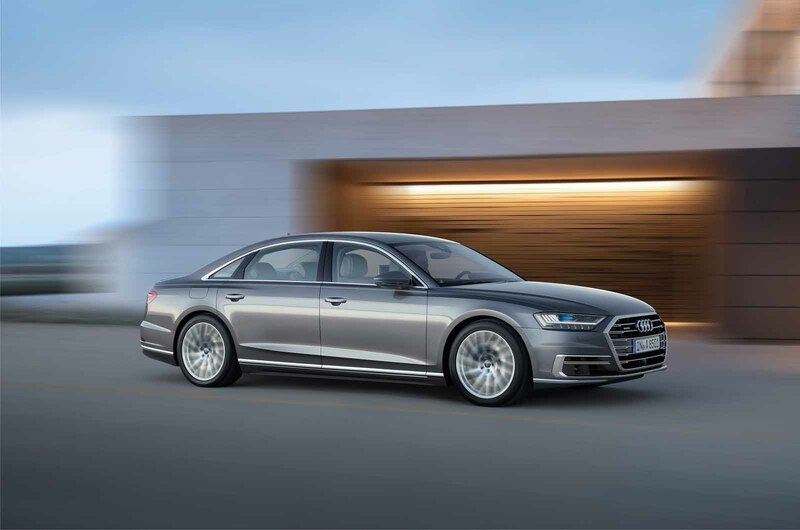 Audi claims the new A8 is the first series production road car to have been developed expressly for what it describes as “highly automated driving”. Comment: will a car become your office of choice? Among the showcase features available from the new A8’s long list of optional equipment is a so-called Traffic Jam Pilot system. Part of a suite of 41 individual driver assistant functions, it takes charge of driving in slow-moving traffic up to a speed of 31mph on motorways, where a physical barrier separates the two carriageways. As well as relying on cameras, radar and ultrasonic sensors, Traffic Jam Pilot is the first automated driving system to be offered on a production car to employ a laser scanner. The new system manages starting, accelerating, braking and steering functions. But without a legal framework for its operation in many markets, Audi says it will adopt a step-by-step approach to the introduction of its new autonomous driving tech. The new A8, which is codenamed D5 within Audi, follows an evolutionary design path. Its exterior appearance blends a number of newly interpreted elements from the earlier Audi Prologue concept car — including a heavily reshaped grille, tauter surfacing and a new tail-light treatment — with time-honoured cues from earlier versions of the Audi flagship. As with the third-generation model, on sale in the UK since 2009, the new A8 will be sold with the choice of two wheelbases. Both are 6mm longer than those of the old A8, at 2998mm and 3128mm. At 5172mm long, 1945mm wide and 1473mm tall, the new A8 is 37mm longer, 4mm narrower and 13mm taller than its predecessor in standard guise. The A8L’s 130mm-longer wheelbase extends its length to 5302mm, with added ride height bringing 4mm to its height, at 1488mm. The body of the new A8 makes use of more materials than any previous Audi model. Aluminium makes up 58% of the structure, but it also adopts steel, magnesium and carbonfibre, which forms the basis of the rear bulkhead. There’s also a second-generation MIB infotainment system that uses a quad-core processor from Nvidia and is claimed to be 50 times faster than the first-generation unit. The A8 will be offered with the choice of two turbocharged V6 engines from the outset of sales in October. One is a 3.0-litre petrol unit developing 335bhp in the 3.0 TFSI and the other a 3.0-litre diesel with 264bhp, 10bhp more than its predecessor, in the 3.0 TDI. Both engines are allied to an eight-speed automatic gearbox and quattro four-wheel drive, which can be ordered with an optional sport differential. The new standard-fit 48V electrical system offers a range of mild hybrid functions, including engine-off coasting, extended start/stop operation and kinetic energy recuperation under braking, via a belt-driven alternator. In early 2018, a further diesel will join the line-up in the form of a turbocharged 4.0-litre V8 with 429bhp in the 4.0 TDI. That’s 44bhp more than the old turbo 4.2-lite V8 engine that it replaces. The biggest engine in the line-up will be a 6.0-litre petrol W12. This revised version of the Volkswagen Group’s turbo W12 is 300cc smaller than its predecessor yet it delivers an added 85bhp, at 585bhp. Although it has yet to be confirmed, a successor to today’s S8 is set to run a powered-up version of the 4.0-litre turbo petrol unit used by the 4.0 TFSI. It will develop around 542bhp, 22bhp more than the outgoing model. The same engine is already used by Audi’s Volkswagen Group sister company Porsche in the latest Panamera Turbo. An L e-tron variant is also planned. It will combine the 3.0-litre turbo petrol V6 with an electric motor for an overall system output of 443bhp. Audi claims an electric-only range of up to 31 miles and plans to offer the new model with an optional inductive charging system for wireless recharging of the 14.1kWh lithium ion battery, which is sited in the boot floor. Alternatively, the battery, which consists of 104 individual cells, can be charged using a standard plug-in cable at either 3.6kW or 7.2kW. An 80% charge is achievable within two hours at 7.2kW, Audi says. Underpinning the A8 is new aluminium-intensive suspension, with double wishbones up front and a five-link set-up at the rear. Air springs are standard and allow four different ride heights. The A8 can also be specified with new active suspension. Similar to the S-Class’s Magic Body Control system, it uses cameras mounted within the windscreen to scan the road 18 times per second and then alter the damping and spring characteristics for each individual wheel. A further development is the appearance of all-wheel steering on selected new A8 models. Already used by BMW on the latest 7 Series, this aims to heighten the responsiveness and overall dynamic character of the A8. Together with the Traffic Jam Pilot, the suite of artificial intelligence autonomous driving functions available for the new A8 also includes a so-called Remote Parking Pilot and Remote Garage Pilot — both operable from outside the car using a smartphone. The first-generation A8, which arrived in 1994, was born from the V8, Audi’s first foray into large cars beyond the A6. Allowing it to compete with the Mercedes S-Class and BMW 7 Series, the flagship V8 model was the first Audi to combine its quattro system with an automatic transmission. The V8 was on sale from 1988 to 1994 and 21,565 examples of it were built. Racing versions of the car ran in the DTM, Germany’s touring car championship, winning the 1990 and 1991 titles. ".. slow moving traffic up to a speed of 31mph on motorways, where a physical barrier separates the two carriageways." If you're in lane 1 of 3 lane motorway what difference would having a barrier 2 lanes to the right both of which would have moving cars in make? When was the last time you saw an Audi in any lane other than the third of a three-lane motorway? Seems like Audi have been working towards this for decades: with their numb driving experience, surely the most interesting way to get from A to B in an Audi is to let the car do it all for you. ...but I'm not a fan of all digital interiors. Touch screens have their place (GPS etc), but I'd still like to have some buttons at my disposal when operating a car's controls. Doesn't mater how clever touch screens can be, they can't beat the tactile feel of buttons, which are also less prone to have the wrong one pressed than touching the wrong icon on a screen. Volvo like headlights, Renault Megane rear lights, Mercedes style interior. This is not at all a criticism. So what point are you making? Lots more stuff to go wrong. Lots more stuff to go wrong. These sort of cars will be in the scrap yards after a few years because they are too expensive or complicated to repair. There will continue to be more and more autonomous driving tech. So what? But as a brand Audi is tired and exhausted, as recent models suggest, and as this flagship model confirms.